Country of Origin Effects: The Interaction of Place and Product? This chapter develops the concept of the county of origin effect, and explores how linkages between place and product may impact upon it. Country-of-origin research has tended to focus upon how geographical associations may assist the marketing of certain products (halo effects) and indeed protect brand images from negative place-based associations (shield effects). We seek to develop these ideas by investigating the existence of branding spillovers in the opposite direction i.e. from product to regional image. Thus we argue in favour of a more ‘holistic' view of country-of-origin effects. This is done using the illustrative case of Wales. 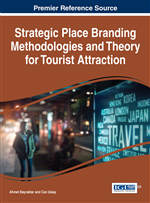 The chapter then seeks to explore the resulting implications for city branding practitioners and policy-makers, and to speculate upon how the observed linkages between place and product can also lead to broader insights in terms of city branding in the international context. Finally how the findings presented might contribute to future research attempts on city branding is considered. This chapter develops the concept of the county of origin effect, and explores how linkages between place and product may impact upon it. Finally it seeks to draw possible lessons for policy-makers. Nations and regions have images, or “brands” that stakeholders often attempt to manage or at least influence. In turn, many products have an association with a region or place, sometimes positively, and sometimes negatively so. These associations interact and shape each other. In this chapter we thus argue that for a holistic view of country-of-origin effects, an understanding is needed of both branding of the region, and branding from the region, nation or place in question. Country-of-origin (COO) research has tended to focus upon how geographical associations may assist the marketing of certain products (halo effects) and indeed protect brand images from negative place-based associations (shield effects). The role of symbolic value here is discussed with the explicit assertion that its importance is increasing and that COO effects can be seen as an example of thereof; although these are likely to vary with the product or indeed place under consideration. We seek to develop these ideas by investigating the existence of branding spillovers in the opposite direction i.e. from product to regional image. This is done using the case of Wales via an investigation of three companies engaged with the changing meaning of their own country of origin – and also of the recent marketing initiatives of the Welsh Government itself. In this way the chapter seeks to contribute a place-based bridging of the destination management literature and the brand management literature. Similarly, the transfer of norms, values and the exchange of information more generally within a shared sense-making framework are typically understood using a variety of concepts such as regional innovation systems (Cooke et al., 2000, 2004; To¨dtling & Trippl, 2005), triple helix (Leydesdorff, 2000), learning regions (Morgan, 1997), clusters (Keeble & Wilkinson, 2000; Cooke, 2002), innovative milieu (Aydalot & Keeble, 1988) and so on. Similarly, “culture” has been discussed in the literature on industrial districts (Piore & Sabel, 1984; Saxenian, 1994), but it is largely regarded therein as a form of (static) regional asset or endowment. While offering a powerful means by which regional economic and innovative performance can be explained, these represent an incomplete picture of the exchange that takes place between a given region and the firms of that region (Clifton et al., 2011); many products have intangible qualities in the market place, which are implicitly linked to their region of origin (Kotler & Gertner, 2004). This in turn means that public policy aimed at influencing the perception of the region—regional branding initiatives—can influence the symbolic qualities of physical products that arise from that region. Moreover, the region as an entity in itself also “competes” in the market place for inward investment, major sporting and cultural events, tourists and skilled knowledge workers (Florida, 2007; Anholt, 2009). With these issues in the chapter seeks to explore the resulting implications for city branding practitioners and policy-makers, and to speculate upon how the observed linkages between place and product can also lead to broader insights in terms of city branding in the international context. Finally how the findings presented might contribute to future research attempts on city branding is considered.